The expectation that a location to safely store spent nuclear reactor fuel has resulted in the construction of over 100 nuclear power plants at various geographic locations within the U.S. This expectation did not consider the possibility that tons of spent reactor fuel would be stored at the nuclear power plant locations indefinitely and that no permanent repository would be found. The Northern Chumash Tribal Council (NCTC) has started grassroots collaboration between the California Central Coast Marine Sanctuary Alliance (MSA), Santa Lucia Chapter of the Sierra Club, San Luis Obispo Chapter of the Surfrider Foundation, Citizens Opposed to Acoustic Seismic Testing (COAST), and others, for the nomination of the California Central Coast Chumash Heritage National Marine Sanctuary as a new national marine sanctuary. The California State Lands Commission (CSLC) studied their 49 permitted offshore low energy seismic surveys (LESS) during the last five years and determined some surveys may have caused both Levels A and B take of marine mammals due to decibel (dB) levels in the range of 200 dB to 234 dB, length of surveys, and lack of adequate mitigations. Indeed, California sea otter strandings increased along the shores where some of the surveys occurred offshore the central coast south of Cayucos, and the public was not warned of possible negative impacts to themselves and to marine life. The California State Lands Commission (CSLC) studied their 49 permitted low energy seismic surveys (LESS) during the last five years and determined the surveys may have caused both Levels A and B take of marine mammals. While typical surveys are expected to last one to four days, several surveys lasted from 20 to 54 days and used decibel levels up to 228 dB. CSLC needs to require a permit for each offshore geophysical survey rather that a three-year-blanket-permit that would not include information about the duration, location, or decibel level of each individual survey. The health of the marine ecosystems in Hanalei Bay and San Luis Bay are seriously threatened by decades of pollution that continue from many sources, including compounded years of pesticides from agricultural runoff, wastewater outfall, toxic sediment, mud, and other pollution flowing through the watersheds to the bays. Hanalei Bay, Hawaii (HI) and San Luis Bay, California (CA) are popular tourist destinations thousands of miles apart across the Pacific Ocean from each other. The communities bordering these bays could become “sister communities,” working together to improve and preserve the health and beauty of their bays by developing coastal health plans and forming marine sanctuaries. Hanalei Bay, Hawaii and San Luis Bay, California are popular tourist destinations thousands of miles apart across the Pacific Ocean from each other. Boasting legendary beauty of ocean and land with natural habitats, the communities bordering these bays could become “sister communities” working together to improve and preserve the health and beauty of their bays. On March 11, 2011, a magnitude 9.0 earthquake struck off the coast of Honshu, Japan, creating a devastating tsunami with over 40 feet tall ocean waves traveling over 100 miles per hour. Once on land, the waves reached heights of up to 133 feet and inundated over 217 square miles. This Tohoku earthquake and tsunami pulled about five million tons of Japanese Tsunami Marine Debris (JTMD) into the ocean, originating both from terrestrial and marine environments, as reported by the Aquatic Nuisance Species (ANS) Task Force. March, 2013 Low Energy Seismic Surveys (LESS) Produce High Decibels Is LESS Actually HESS? Low Energy Seismic Surveys (LESS) are blasting at high decibel levels nearshore and offshore California’s coast, including within National Marine Sanctuaries and State Marine Protected Areas. These surveys do not warn the public or initiate the California Environmental Quality Act (CEQA) process because California State Lands Commission (CSLC) continues to use their inadequate and outdated 1984 CEQA for LESS. We are concerned the Low-Energy Seismic Surveys (LESS) have been adversely affecting California’s coastal marine resources, placing the public in harms way, and damaging commercial and recreational fishing. Our concerns are based on the high decibels (dB) of 216 dB and 223 dB produced during LESS. California State Lands Commission (CSLC) only considers energy input of 2 kilojoules (kj) to define LESS. This definition does not include the sound pressure levels the National Marine Fisheries Service (NMSF) uses to define dB levels for marine life safety. For public safety, all California State Lands Commission (CSLC) geophysical survey permits (GSP) need to be immediately suspended. Human safety needs to be the priority. CSLC does not consider potential physical harm people could receive if decibles (dB) are over 145 dB when recreating in the nearshore ocean. We wonder, has anyone recreating in the ocean during the surveys received physical harm or died? Our research found geophysical surveys that produced 232 dB in Hueneme, and 216 dB offshore in San Luis Obispo County. The CSLC general geophysical permit requires dB to be listed, but does not print dB on the permit or consider the potential for human harm. The CSLC places the unknowing public at risk of bodily injuries and death from pressure waves forced through their bodies while recreating in the ocean. While marine animals have many natural defenses, they are powerless against human threats of pollution, ocean warming, over-industrialization, and acoustic high intensity seismic testing (HESS). A marine sanctuary is one of the few locations for sustainable fishing, and for marine mammal protection. However, the area between two sanctuaries has little protection. PG&E is planning to use high intensity acoustic blasting between the Channel Islands and the Monterey Bay Sanctuaries off the central California coast. Both sanctuaries are concerned about the decibel level of the pressure waves as they enter the sanctuaries. These two protected sanctuaries and the ocean area between them share many marine species that swim into the seismic testing ocean area to feed. Marine mammals especially feed from the year-round persistent upwelling between Point Conception and Point Sal. This upwelling flows through the submerged five-fingered Arguello Canyon and the Rodriguez Seamount north of the Channel Islands National Marine Sanctuary. Whales have been coming close to shore in Avila Beach & Port San Luis Harbor as if to communicate: Please see us, hear us, save us; don’t allow PG&E to kill or deafen our family and the ocean’s web-of-life. The humpback whales are bringing worldwide attention to PG&E’s proposed seismic tests. 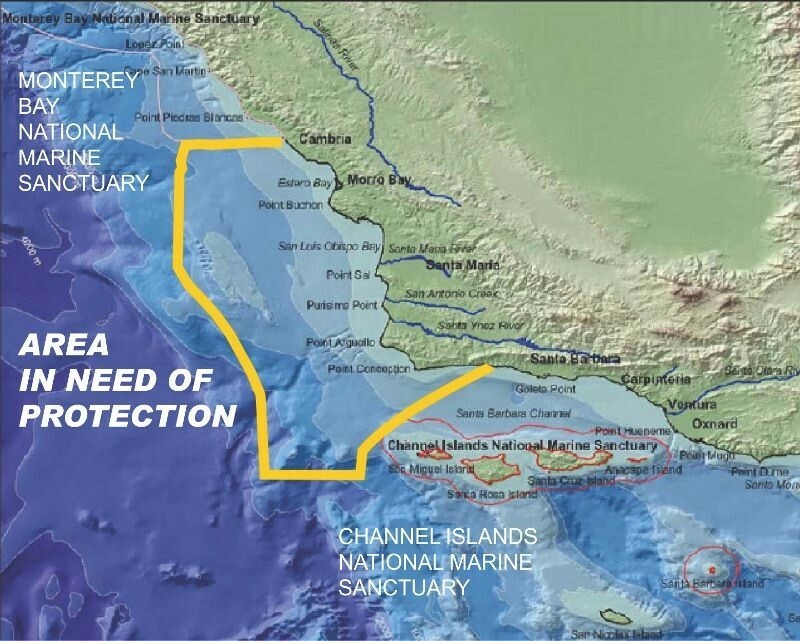 Several Marine Protected Areas (MPAs) lie within San Luis Obispo County’s coastal waters. As defined by the California Department of Fish and Game, “MPAs are named, discrete geographic marine or estuarine areas designated to protect or conserve marine life and habitat.” MPA’s jurisdiction is from mean high tide line to three miles seaward. California’s Marine Protected Areas (MPAs) are mandated by the state’s Marine Life Protection Act (1999). Three nautical miles, from mean high tide line to three miles seaward, is the jurisdictional limit for the U.S. state of California. As defined by the California Department of Fish and Game, “MPAs are named, discrete geographic marine or estuarine areas designated to protect or conserve marine life and habitat.” The purpose of these MPAs is to increase California’s coherence and effectiveness in protecting the state’s marine life and habitats, marine ecosystems, and marine natural heritage, as well as to improve recreational, educational, and study opportunities provided by marine ecosystems. PG&E’s proposed seismic testing is expected to destroy fish stocks for an unknown length of time. The local fishing associations are negotiating for paid mitigation for destruction of the commercial fish stocks. No mitigation is planned for the local communities’ losses or for the ocean ecosystem destruction. Kelp forests are among the most productive ecosystems on earth and worthy of ocean protection. “Jean-Michael Cousteau: Ocean Adventures, Kelp Forest” video by PBS gives an intriguing introduction to the balance of life within California’s coastal kelp forests. Wetlands are the most biologically productive of any habitat. They are critical to the survival of local and regional ecosystems because of the diversity of species they support. Coastal wetlands form a vital link between land and sea, exporting nutrients and organic material to ocean waters. Imagine a San Luis Obispo (SLO) County Heritage Fishing Area encompassing both Morro Bay and Port San Luis with its heritage fishery as protected waters from the coast to 45 miles offshore for the local fishing community. Heritage fisheries can be carefully maintained aquatic areas where the habitats within the ecosystems surrounding fishing are protected from today’s modern hazards. The goal of preserving fishing for the future can be achieved by using sustainable fishing methods. Have you ever wondered what lives under the kelp floating in our California nearshore waters? Watch a sample of this video to enjoy a mind-expanding view of the underwater world along the California Central Coast.The kelp forest ecosystem is one of the most diverse places in the world and one of the least explored, known or understood.This DVD shows many ocean creatures, including: giant lingcod, huge schools of rockfish, rare angel sharks, colorful sea slugs and anemones in every color of the rainbow, 300 pound seals, giant crabs and lobsters. Slo Coast Journal, March, 2013 – Low Energy Seismic Surveys (LESS) Produce High Decibels Is LESS Actually HESS?